The environmental movement today is at a critical crossroads. Crossroads: Environmental Priorities for the Future is an in-depth assessment of the movement's successes and failures, and also offers prescriptions for the future. 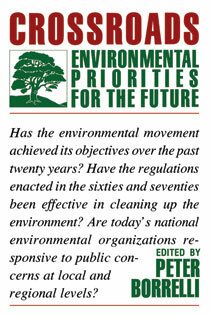 It includes contributions from some of the country's top environmental leaders and activists, including Barry Commoner, Stewart Udall, William K. Reilly, Gus Speth, Jay Hair, Lois Gibbs, Michael Frome, Chuck Little, and William Futrell. Chapter 5. A View Toward the Nineties \ William K Reilly, Jr.